Serro Scotty trailers were built from 1957 until April, 1997, when the plant in Irwin, Pennsylvania burned down. The plant later reopened in Mt. Pleasant, Pennsylvania, but not to make travel trailers. Today, known as Mobile Concepts by Scotty, they manufacture fire safety "houses". Due to their easy availability, low cost, and the increasing population of retiring baby boomers, there has been a resurgence of popularity for these small trailers that can typically be towed by even a 4-cylinder, and stored in the family garage. 1956: John Serro, recently retired as a car salesman, builds a 16 1/2' trailer in his garage that no one wanted to buy. 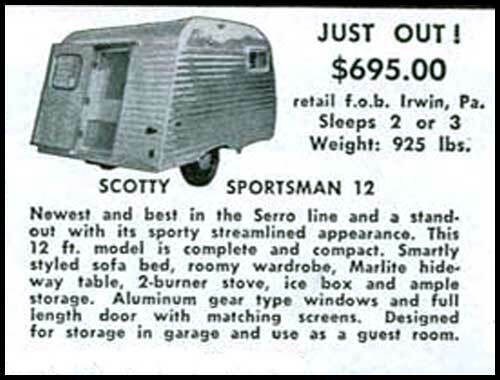 1957: Serro introduces a 10' teardrop trailer. 225 of them were built through 1960. This trailer was called the Sportsman. 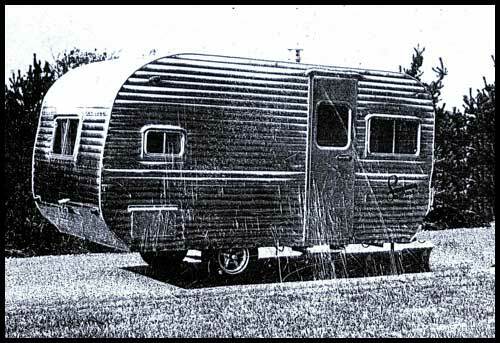 1958: A 13' trailer was added and it became the Sportsman, Sr., with the teardrop now renamed the Sportsman, Jr.. It was originally offered with both a full time bed (called a Mattress Model) and a couch that pulls into a bed model, later renamed Gaucho. This trailer really took off. 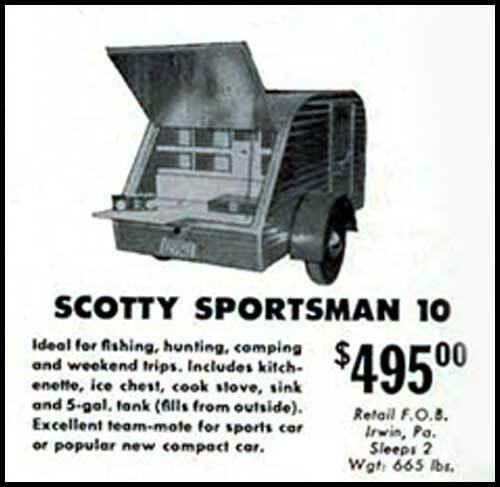 1959: A 12' rear-door model, official name Sportsman 12, is introduced. This model lasts only six months and is dropped in 1960. Only six are known to still exist. 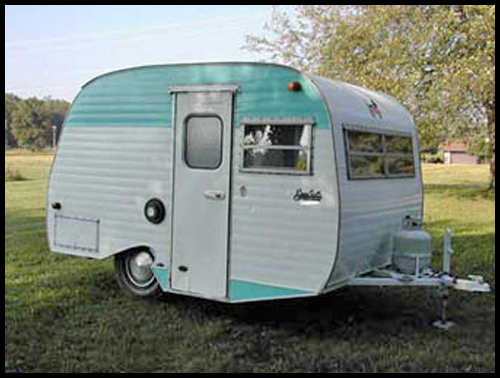 1960: Sportsman, Jr. (teardrop), Sportsman, Sr. (13') and a 15' model are offered. Final year for the teardrop, of which only 225 were built. They begin using a tear-drop "swoosh" shaped wheel well opening (Many other trailers also have a swoosh wheel well opening, including Oasis, Cardinal & Travelese). 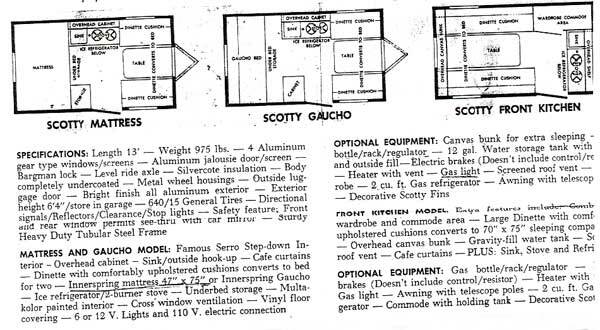 1961: three 13' models were offered: Mattress, Gaucho, and Front Kitchen, as well as two new 15' Front Kitchen models, Sportsman 15 and Scotty with Potty 15. Wings were an option. 1962: This is the last year for the 15' Front Kitchen and the front window style changes. The new front window is a wider, 3 panel window. 1963: The Bristow, OK plant opens and the trailers are now offered in aqua and white as well as polished aluminum. Bristow Scottys differ from Irwin in that they have added height above the door and they have full cabinets (to ceiling) to left of door, i.e. a wardrobe. Scottyland, a 230 acre campground, at that time, solely for Scotty campers, opens. 1964: Only aqua and white trailers are now available. 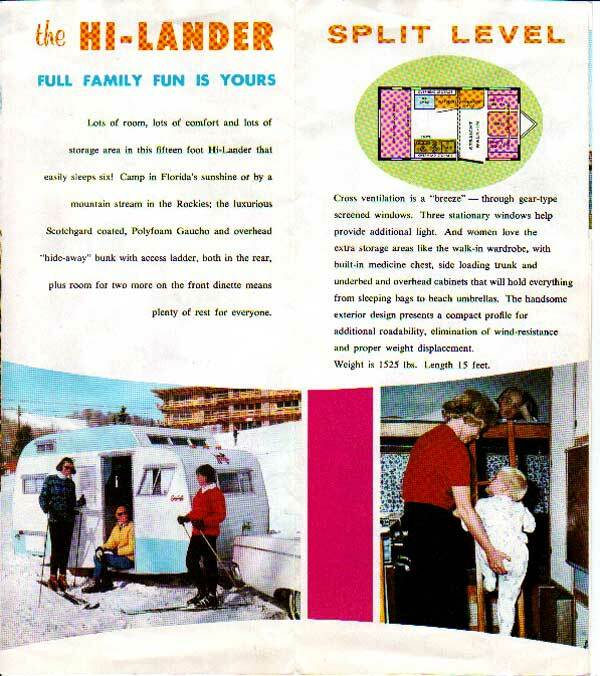 The "split-level" 15' HiLander is introduced and the 13' trailer height is increased by 6"
1965: The HiLander is restyled to move the "Sun Deck" forward of the door for easier entry. 1966: The "Front Kitchen" becomes known as the Tonga. 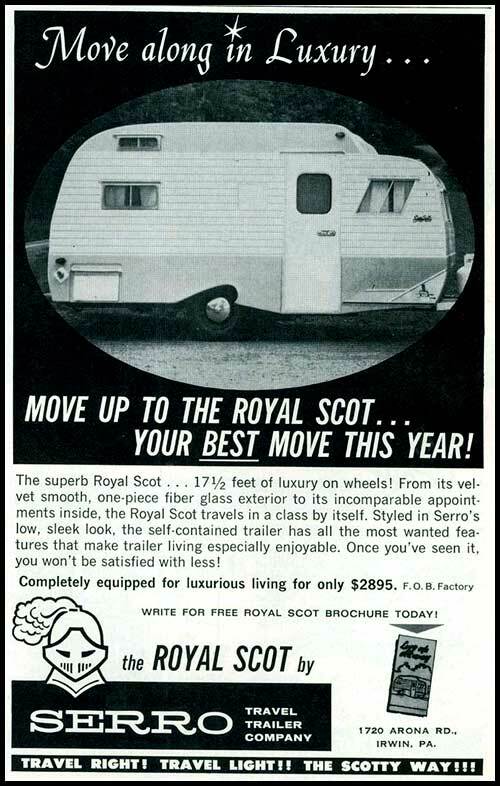 Also, the Royal Scott, a 17 1/2' one-piece fiberglass trailer was built. It proved too expensive and too heavy and it was quickly discontinued. 1968: A new plant opens in Ashburn, GA. This is the last year for the Tonga (front kitchen) model. 1969: The window style changes again to a square cornered jalousy style. Separate eyebrows are no longer used because they are styled into the windows. Only the 13' and 15' Gauchos are offered, along with the 15' HiLander The trailers move to the 60" wide front and back windows. 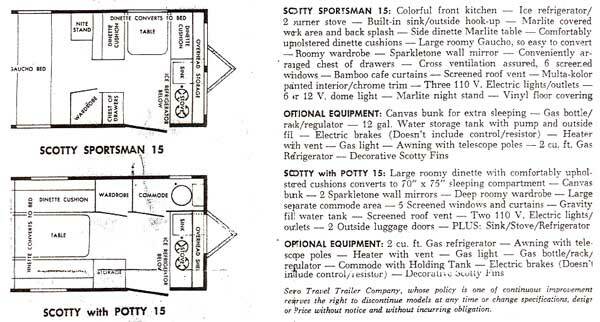 1970: Most of the Scottys offered have jalousy windows in the door. 1971: Most still have jalousy windowed doors, and the interiors move from the blue spatter to a fake woodgrain vinyl paneling. The 18' HiLander is introduced. This is commonly called a Trunkback because of a bump-out storage compartment on the rear. This trailer uses a panelized construction method, not used on any other Scottys. The outer skin is laminated to a foam insulation with the inner skin laminated on the inside. 1972: Last year for the overhead skylight windows in the HiLander. Early 1972 models still had them but by September, ads no longer showed them. 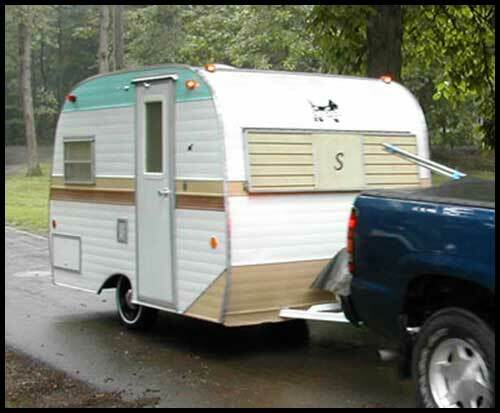 1973: A tan panel is added to the lower front of the trailers, in addition to the aqua and white. The 15' HiLander no longer has the overhead skylight windows. 1974: Models became 8" wider (from 76" overall width to 84"). 1975: A new model called the JS715 replaces the 15' Gaucho model. This model had top bunks above the back gaucho and the dinette (JS=John Serro, 7=sleeps 7 & 15=length). Also offered were the 13' Gaucho, the 15' HiLander, and the 18' HiLander. 1977: A rare 14' model was offered and marketed to retired couples. It was a combination of a front kitchen and a gaucho. It wasn't popular and was only offered in 1977. The VIN on this model ends in SE, theorizing "Special Edition". 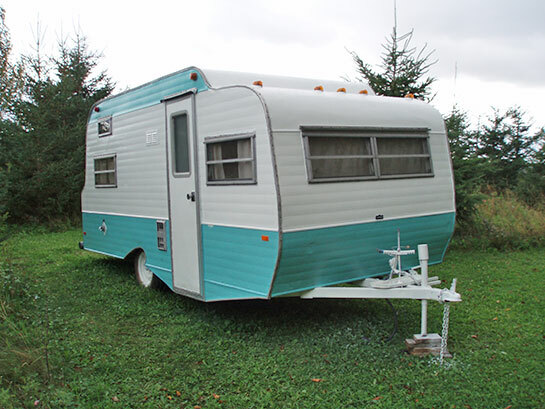 1978: Trailers now have a tan and bittersweet stripe down the middle of the sides are now used with the aqua. 1979: First year for no aqua to be used on the Scotty. Also the first year for the jagged stripe down the side, using tan, bittersweet, orange, and black. Lots of new models introduced this year - the 12.5', 13.5', 16', 16.5', 17', 19.5', 24.5', 26.5', 28' and 32'. 1980s: Trailers are more boxy shaped. Both the Ashburn, GA and Bristow, OK plants are closed due to lack of business. 1982: A new 13 1/2 model is introduced. The door is located behind the axle and the kitchen is in the rear. It has a bathroom! 1985: By this year, the name Regalia is introduced. 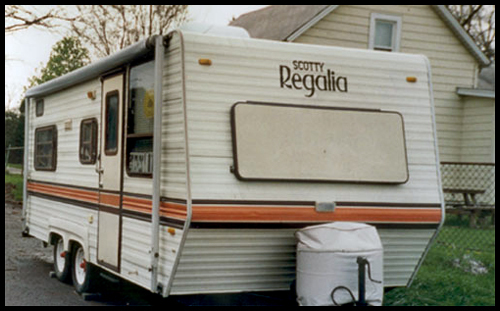 1990: The 1990 Scottys are top of the line and Serro offers a full line of trailers, all the way from 13' through 50' park models and even three sizes of fifth wheel models. 1995: Serro adds motorhomes to the mix. 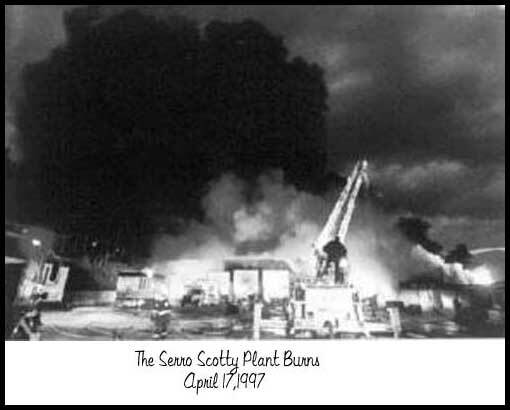 1997: Serro plant burns to the ground and Serro stops manufacturing travel trailers. Scotty is still in business in Pennsylvania but is now known as Mobile Concepts by Scotty. They now make Police and Fire Safety trailers. 1998: Alan Colwell, a Scotty owner from New Hampshire creates a Yahoo group for Serro Scotty Owners, the Serro Scotty Camper Enthusiasts (SSCE). 2004: Nancy Kroes, a webmaster and Scotty owner from Michigan creates the first ever website for Serro Scotty Owners. 2005: The National Serro Scotty Organization (NSSO) is formed as a place to share collected wisdom and pool resources to help each other out. Now the most highly regarded organization in the world for Serro Scotty enthusiasts, the NSSO holds a National Scotty Rally each July and hosts many camp-outs each year through-out the country. 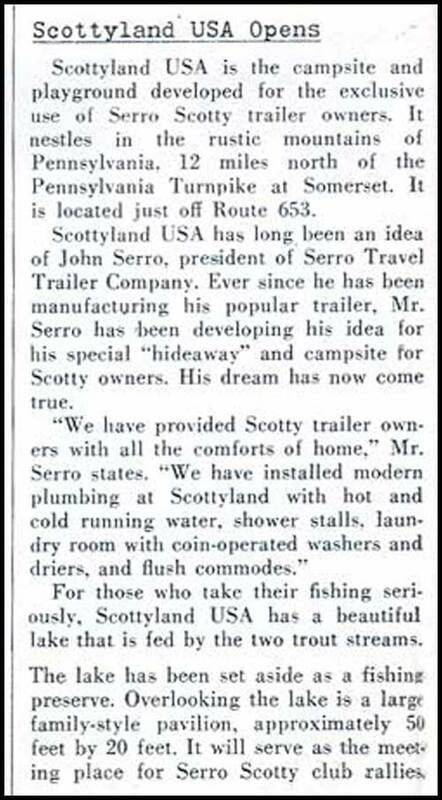 2007: Serro Scotty Worldwide is formed when a Pennsylvania business man, Bill Kerola, buys the right to use the Serro name and begins production of new, but vintage-looking, Scotty trailers. Manufacturing of these new Scottys changed locations several times. As of 2012, they no longer looked like vintage Scottys and by 2015, were no longer being made. 2016: Little Guy, a trailer manufacturer announced they purchased the right to use the Serro Scotty name and they began manufacturing retro "Serro Scottys" in 2017. 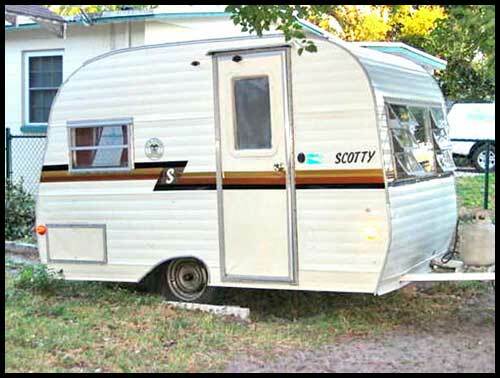 As of November 2017, all they are still offering is retro trailers branded with the Serro Scotty name. Their website says they will be offering "the Sportsman", which has the vintage Serro Scotty look, but production dates keep changing, and now they just offer a link to be emailed release details.